A 2010 release showcasing 33 titles from Greg Scholl. There is a main menu, listing five chapters. Play All is another option. Some military video titles are included. There is also another release, a Steam Preview DVD. That will be another review. US Contemporary, Canadian, Vintage Film Era, America by Rail and World War Two are the chapter selections. The previews themselves are pretty short. Average time is about one minute, give or take 30 seconds. They play too briefly. You get a glimpse of a show. The quality of the images look fine. Natural sounds are crisp and clear. The style of this preview disc differs from some of the others in the marketplace. Some producers just lift out segments direct to a preview show. This has the advantage of letting prospective customers get a uniterrupted look at a given program. The overall feel of the show can also be judged. Greg Scholl has much custom preview narration. He explains an overall description of what is contained within each show. In this way, I can’t tell what actual narratives and the majority of music backgrounds are like. The camerawork appears sharp on the railroad shows. The descriptions are concise, right to the point. There are some great shots to be viewed. Other titles include: Norfolk Southern’s Peavine, A Day On Soldier Summit, Early Diesels 3, VIA F’s in the Rockies, Reflections, Illinois Junctions, Santa Fe Pictorial, Ohio Rail Diamonds, Cab Ride Over Kicking Horse Pass, Union Pacific’s Caliente Subdivision, Rochelle, and more! There are plenty of worthwhile titles on this preview program. They appear to be quality shows. The Canadian series offers some outstanding scenery. The US Contemporary has the promise of excellent film sequences. Vintage film is always worth viewing. The six military previews are outside of our intended subject matter. They look good. This is a quickly paced presentation. The previews are a little too short. I would have preferred an emphasis on: direct scenes, as they are presented, with that shows narration and soundtrack. 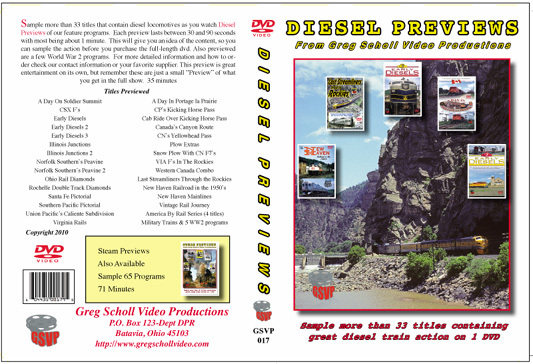 This entry was posted in ATVR Reviews, Greg Scholl and tagged American Train Video Reviews, Amtrak, Burlington Northern, California, Canada, CSX, new releases, Railroad, Rio Grande, Santa Fe, Southern Pacific, Train DVD, Union Pacific by William J. Hudson. Bookmark the permalink.